This submission provides written record of comments I gave in-person on June 21, 2017 at the Gloucester community listening session of the Governor’s Council to Address Aging in Massachusetts. My name is David Bergeron. I am the owner of Beauport Hearing Care, a full service hearing instrument practice in Magnolia, Massachusetts. Thank you for coming to Gloucester. I wish to shine a bright spotlight on the importance of hearing health care. Healthy aging and good hearing health are linked. But hearing health care is deeply misunderstood. People think it's all about hearing aids, and it's not. First we must recognize how important our hearing is and most especially how important it is to protect it before we acquire hearing loss. Most hearing loss is preventable. The best way to treat hearing loss is by preventing it. We need to pay a lot more attention to hearing conservation and how to protect our hearing from harmful loud noises. And then we need to treat hearing loss when it occurs. Real treatment of hearing loss is aural rehabilitation. The fitting of hearing aids is often an important component to aural rehabilitation. But hearing aids alone are not the whole treatment program. The human hearing system involves the sensation of sound in the ear and cochlea. But then the signal travels up the brain stem for processing in the brain to understand what is heard. Untreated hearing loss can have neurological effects to the auditory centers of the brain. Auditory deprivation causes those parts of the brain dedicated to auditory processing to go to sleep. Moreover, hearing aids do not restore natural sound. So a brain that begins receiving amplified auditory signals in frequencies that have not been heard for a long time may not know how to interpret the new signals. Things sound different. New hearing aids can be very overwhelming without proper professional guidance on how to adopt their proper use. Some people adopt hearing aids easily and others need a lot more help. It is essential for the public to understand this. People that get new hearing aids sometimes believe their hearing aids do not work. Family members may complain that a lot of money was spent on hearing aids, and the user still cannot hear. But hearing aids do work! In many cases people new to hearing amplification need auditory training. The brain needs help and time for the patient to experience the full benefit of their new hearing instruments. Hearing aids may be correctly programmed and appropriately fitted to someone with hearing loss, but the patient may still say, “I can hear what you are saying, but I can’t understand.” The hearing professional offers games and exercises to help wake up brain auditory processing. But it takes time, and people need to understand that treating hearing loss is a process. It is not just a matter of getting hearing aids. Hearing is a social experience all about communication. No one hears by themselves. Hearing happens when we are communicating. Therefore the treatment of hearing loss must incorporate an understanding of the social dimensions of how we hear and communicate. Sometimes people with hearing loss need help and cooperation from family members and co-workers in order to gain the full benefit of hearing aid amplification. Communities need to talk about how everyone can help one another mitigate and prevent hearing loss. We need to have a lot of conversations about hearing loss. Get our communities educated and motivated to take action and take care of our hearing. Health insurance should provide coverage for aural rehabilitation and hearing instruments. Mass Medicaid is a good template for covering 'hearing aids' but health insurance should also reimburse hearing instrument specialists and audiologists for providing aural rehabilitation counseling and auditory training. Case managers, outreach workers, everyone working in a ‘community health worker’ (CHW) role should be trained to conduct hearing screening, provide general education on hearing health care, and provide clients with navigation support so people screened with hearing loss actually reach the hearing care clinic. CHWs can help people better understand the process and especially what to expect from their providers. These CHW services should be reimbursed by Medicaid and all health insurance. CHW navigation support and follow-up is critical to ensure that patients continue to receive aural rehabilitation after they have been fitted with hearing aids. Without this follow-up care, many hearing aid users give up in frustration and stop using their hearing aids. They never know why they did not succeed. I submit that there is already ample scientific evidence on record to justify health insurance coverage of hearing health care as a cost savings strategy. Moreover, health insurance should cover real hearing health care. That means compensating all licensed hearing care providers for aural rehabilitation and hearing aids, and reimbursing CHW services that ensure patients access the hearing health care services they need to succeed in their treatment. There is a lot of talk in Washington DC about how to improve access to hearing health care. Academics and special interest representatives that never see patients are not going to figure out how to fix hearing health care. Hearing loss is a community challenge. Therefore, people must address it right here in our communities. We need discussion groups. In addition, agencies that work with seniors must gather professionals, volunteers, and clients to talk with one another about how to improve hearing health. Our communities must get educated and motivated to support real community solutions to socially address hearing loss and hearing conservation. We must understand that hearing is a social experience and effectively treating hearing loss must involve cooperation of the whole community. Shine the spotlight on hearing loss and hearing health care! Require health insurance to cover real hearing health care, including high quality hearing aids and aural rehabilitation. Train CHWs to help people cross the bridge successfully to the hearing care clinic. Finally, health insurance must reimburse CHW services related to hearing health care. Testimonials Emphasize Need for Ongoing Hearing Aid Services and Coaching - Click here to view the video. Veterans packed Cape Ann Veterans Services to talk about hearing health care. Veterans said they need local hearing specialist services. GLOUCESTER – Veterans packed Cape Ann Veterans Services on Friday, June 9th to talk about their hearing. They said they need local hearing specialist services. And a new law known as 'Fit to Serve' allows the VA to honor their request. State Senator Bruce Tarr and State Representative Jerry Parisella were there to listen. In addition, aides for Senator Elizabeth Warren and Congressman Seth Moulton were also there. Hearing loss and tinnitus (e.g., ringing in the ear) are the two top claims at the Veterans Administration (VA). Area veterans have access to free hearing aids from the VA audiology clinic in Jamaica Plain. But many find it very difficult to manage the return visits necessary to keep their hearing aids in working condition. Director of Cape Ann Veterans Services, Adam Curcuru welcomed everyone. He said, "Hearing health is a major concern. We get several calls every week from veterans looking for help with their hearing." David Bergeron of Beauport Hearing Care spoke briefly to start the discussion. He said taking care of our hearing is more important than people realize. And policy makers are taking notice. He said, "There is a lot of talk in Washington about hearing health care and how to fix it." He continued, "They are even talking about over-the-counter hearing aids. But the best thing to come out of Washington is the new 'Fit to Serve' law." This law directs the VA to incorporate hearing specialists into the Veterans Administration system. Finally, this should make hearing aid services more easily available to folks in their local communities. Veterans had lots of hearing health stories to tell. Commuting time to the VA‘s Jamaica Plains audiology clinic can take two to three hours or even more. It takes a whole day for a 15-minute hearing aid cleaning. Some veterans noted that Veterans Choice is available outside of a 40 mile radius to a VA clinic. But 40 miles in a rural area may be an easy commute compared to a metro area like Boston. One veteran noted, "The 40 mile rule should be flexible for vets in congested areas like Boston." Moreover, veterans said it's not just a matter of transportation and a difficult commute. Wait times are too long. They said timely access to ongoing professional services, instrument repairs, and patient education is crucial. Jeannie Anderson spoke in strong support of local hearing care services for veterans. She said hearing coaching was also very helpful to them. Jeannie Anderson said, “Judi and David talked with my husband and I about how to communicate better while using hearing aids. It changed our lives.” Don Anderson added, "I highly recommend the services of Beauport Hearing Care. I probably would not be wearing hearing aids without them." Rockport Legion Commander Mel Olson said vets started using their hearing aids after they got services from a local specialist. Some said they got frustrated with their VA-issued hearing aids. Therefore, they stopped using their hearing aids because they didn't work. But then Beauport Hearing Care was able to get them working properly. New legislation signed into law this past December authorizes the Veterans Administration (VA) to hire Hearing Instrument Specialists. The VA has not yet implemented the law. State Senator Bruce Tarr addresses the group ahead of State Rep Jerry Parisella who is seated to the left of Senator Tarr. German POW veteran Mike Linquata said military personnel got hearing loss whether or not they were on the front lines of battle. Taken prisoner of war during the Battle of the Bulge, Mike Linquata noted folks working behind the front lines were also impacted. He said, "Guys supporting infantry with artillery and others on air fields were all exposed to loud noise. And no one talked about protecting your hearing back then." Over-the-counter hearing aids do not help the public as promised. The far better answer is health insurance coverage for real hearing health care. Over-the-counter sales of hearing aids are getting a big push in Congress. Currently hearing aids are only available from licensed providers. Proponents say over-the-counter sales will lower consumer hearing aid costs. But opponents say over-the-counter hearing aids will end FDA consumer protections. This places consumers at risk because they lose the guidance and safety of licensed providers. Moreover, lower costs have not increased hearing aid use in the past. Even people that get free hearing aids do not automatically use them. There is a smarter way to lower consumer costs and help more people hear better. Make health insurance cover real hearing health care. Veterans pose outside Cape Ann Veterans Services with Beauport Hearing Care provider Judi Bergeron, BC-HIS. Hearing Partnership provided free services to veterans. Hearing coaching and local hearing aid services were more important to hearing aid adoption and treatment success than the cost of free VA-issued hearing aids. Only about 15% of Americans that need hearing aids actually use them. And studies show untreated hearing loss is driving up health care costs. Untreated hearing loss is associated with early onset dementia. Hearing loss is also associated with increased hospitalizations from falls. Effective treatment lowers health care costs. Most people feel health insurance should cover hearing health care. And why not since treating hearing loss lowers costs? But special interests are pushing over-the-counter hearing aids instead. There are public costs for this. Consumers loose the guidance of licensed hearing care providers. And they loose the protection of FDA rules that licensed providers must follow. For example, FDA rules require licensed providers assess need for medical attention. Moreover, many people need coaching to succeed with hearing aids. Health insurance coverage of quality hearing health care would lower consumer costs. Finally, insurance coverage of hearing coaching (i.e., aural rehabilitation) and tinnitus care would go a long way towards increasing hearing aid use. Special interests claim cost is the reason more people do not use hearing aids. They say hearing aids just cost too much. Consumers can save money by testing themselves and picking their own devices. But the evidence tells a very different story. Even free hearing aids do not automatically result in more people using them. Hearing aid use in countries where they are free is similar to their use in the United States. And American veterans also get free hearing aids. But veterans are no more likely to use hearing aids than other Americans that must pay for their hearing aids. In addition, we see plenty of veterans in our Beauport Hearing Care practice with hearing aids that are not working. But we get them working. Hearing Partnership conducted an informal experiment. We wanted to demonstrate a better solution. Fit to Serve became law in December 2016. This law aims to help veterans get easier access to hearing health care. Implementation of this law offers a perfect opportunity to model a better way to reform the hearing health care system. Our Beauport Hearing Care practice provided services to veterans at no cost. First of all, our idea was not to replace Veterans Administration (VA) audiology services. Rather, we wanted to help veterans be successful. Many veterans we helped were not wearing their free VA-issued hearing aids. Furthermore, others had never tried hearing aids before. Some veterans we served had mild to moderate hearing loss and others had more severe losses. So we wanted to see if coaching and local hearing aid services increased success. It did! Most veterans needed coaching. Some needed hearing aids fitted or adjusted. All needed hearing aid cleaning. The veterans that did not wear hearing aids before are now using their new VA-issued hearing aids. Moreover, some of these veterans did not even know they were eligible for free hearing aids. We guided them to the VA. Most of all, every veteran said our extra help made the difference they needed. Veterans will speak publicly about their hearing health experiences at a special meeting on June 9th at Cape Ann Veterans Services. The veterans want public officials to know how community-based hearing aid services changed their lives. (Click here to learn more details). In conclusion, coaching provided with local hearing aid services are more important factors than cost alone! There are many studies that confirm this conclusion. It takes a community to fit a hearing aid. Hearing problems often involve neurological issues. As a result amplification alone does not address it. But aural rehabilitation and other treatments do. Every hearing loss case is unique. Sometimes moderate cases need more help than severe cases. Occasionally medical referrals are recommended. Moreover, some patients with moderate higher frequency hearing loss need amplification with less distortion in higher frequencies. Therefore, cheaper devices aren't enough. Consumers with any hearing loss deserve real help. People need the guidance of licensed providers. We call on advocates to promote health insurance coverage of hearing health care. That is the best way to lower consumer costs and lower health care costs. Most of all, people need quality hearing aids. And they need the help licensed professionals alone can provide. Some advocates say they receive calls daily from consumers that can’t afford hearing aids. But such calls are evidence of the need for health insurance coverage of real hearing health care. They are not evidence that people want over-the-counter hearing aids. People want help! Tell Congress: We Want Health Insurance Coverage – Not the false promise of Over-the-Counter Hearing Aids! Oppose S.670/ H.R.1652, titled, "the Over-the-Counter Hearing Aid Act of 2017”. Make health insurance cover hearing aids and quality hearing health care. Want to take action? Click here for the International Hearing Society online action alert. The federal government’s National Academy of Sciences, Engineering, and Medicine (formerly the Institute of Medicine), concurred with the Hearing Partnership in a highly anticipated study published on June 2, 2016, Hearing Health Care for Adults: Priorities for Improving Access and Affordability. Hearing Partnership highlighted its vision of hearing care innovation to the National Academy in early 2014 and again in 2015. The Hearing Partnership proposal appears in the study’s Recommendation #10, one of the Academy’s 12 recommendations contained in its Final Report. David Bergeron, MM, CHW addressed the National Academy of Sciences, Engineering and Medicine in January 2014. Partnership vision. He spoke at the very first meeting of the National Academies’ Committee on Accessible and Affordable Hearing Health Care for Adults on January 14 and 15, 2014. Hearing Partnership also submitted written comments in the record to the Academy immediately following its April 27, 2015 committee meeting. See our written comments at http://hearingpartnership.org/?page_id=179. Beauport Hearing Care is Hearing Partnership’s model practice where we put our vision of care to work with our patients. And our contract work with the Massachusetts Commission for the Deaf and Hard of Hearing aims to apply our approach to help Boston Marathon bombing survivors meet ongoing hearing care needs. 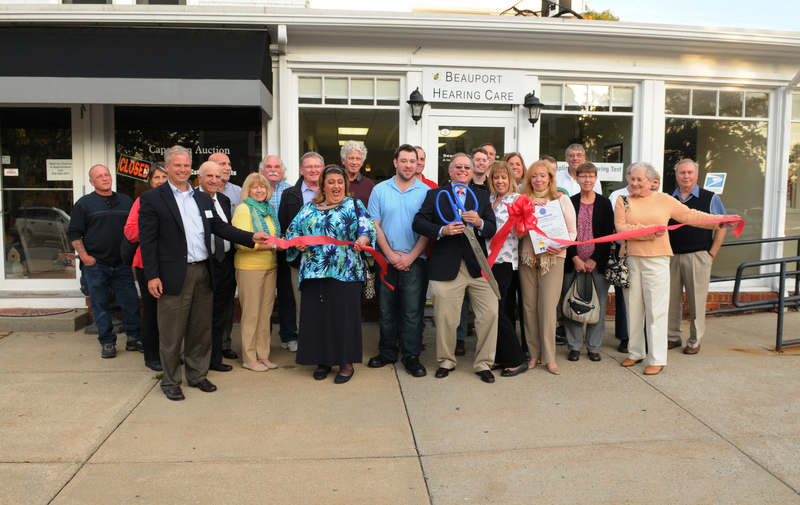 Hearing Partnership™ is proud to announce the launch of its hearing instrument practice: Beauport Hearing Care™ in beautiful Magnolia, Massachusetts. Hearing Partnership™ remains as committed as ever to its vision of hearing care trained community health workers. Beauport Hearing Care™ is the practice-based venue for our research to improve patient quality outcomes and success in hearing health care. Hearing Partnership™ and Beauport Hearing Care™ were joined by patients, friends and colleagues, public health officials and political leaders to celebrate the launch of our practice mission. Click here to see the Cape Ann Chamber of Commerce news release. The Hearing Journal names the Hearing Partnership™ as one of three pioneering efforts to watch in U.S. hearing care. Hearing Partnership™ coaches function as ‘community health workers’ in public health academic terms; see the cover story in the May 2015 issue: Read the article, “Community Health Workers Bridge Gap to Hearing Loss Treatment”. I am happy to follow the students. Weren’t their presentations wonderful? They are the future. I would like to thank Commissioner Reed, Deputy Commissioner Ford, and everyone at the Commission for the Deaf and Hard of Hearing for their dedicated hard work. They are our Commission. They have to think and worry about 1 million people with some kind of hearing loss. With so many – I don’t know how they do it. Please join me in thanking our Commission. [David leads a round of applause]. When I think about the 1 million, I wonder how many audiologists, hearing instrument specialists, and other hearing care professionals we need to help all those people. They need help. How are we going to help them? Everyone thought this is a brilliant idea and signed our petition. It’s a simple idea. So, what do ‘community health workers’ do? They help connect patients to services and resources they need…if a patient needs a ride to their next audiologist appointment, a ‘community health worker’ can help with that. If a patient is confused about how to apply for health insurance or an insurance claim, a ‘community health worker’ can help with that. If a patient has questions about hearing assistive technology, a ‘community health worker’ can point the person to where they can find the information or provide the general information directly. It’s about the simple stuff that patients need to be successful to improve their quality of life and health. It’s about helping with the small things that make a big difference. And the people support this idea. According to the US Health and Human Services, there are at least 120,000 ‘community health workers’ working across the country under a great many different job titles…120,000 in areas such as diabetes, oncology, general health, and more – but not in hearing health care. Not in hearing care. It’s impossible to imagine that so many people could be working in this capacity unless ‘community health workers’ are producing value and real benefit to patients. So why not in hearing care? Some people ask why. Bobby Kennedy said, “Some people ask, why, I ask, why not.” So, why not do this in hearing health care. We can do this. Our Commission is to be congratulated for leadership in promoting research and development of ‘community health workers’ in hearing care. The Commission is leading. I have over 400 signatures on a petition supporting the Commission’s request for resources to do this. I thank the Commission for leading on this important request. And I thank you for listening to me. We, the undersigned voters support the patients and family members of the 1 million legally deaf and hard of hearing people in the Commonwealth, and WE urge the Governor and members of the Legislature to support the request of the Massachusetts Commission for the Deaf and Hard of Hearing to fund research and promotion of specialized hearing care ‘Community Health Workers’ (CHWs). CHWs are proven to help patients achieve better health. Judi Bergeron (left) and David Bergeron (right) present Commissioner Heidi Reed (center) of the Massachusetts Commission for the Deaf and Hard of Hearing with over 400 petition signatures in support of the Commission’s ‘community health worker’ initiative at the Statehouse on April 14, 2015.